Bethesda’s Fallout and Minecraft will be merging in the latest DLC for the successful block-building game, letting players use scrap material that they will find throughout the Wasteland to survive and fend off enemies. The Fallout-themed DLC will let players create water pumps, intrinsic bases, and structures, all to survive the harsh post-apocalyptic world of Fallout. The DLC will be available for PS3, PS4, PS Vita, Xbox 360, Xbox One, and Wii U. The add-on pack will provide the player with 44 new skins inspired by Fallout characters, of course, including Vault Boy, the game’s mascot. The crafting interface will be similar to Fallout’s Pip-Boy, and the player will be able to explore the wasteland joined by a loyal canine partner. Minecraft: Fallout Edition DLC. Image credit: Minecraft. 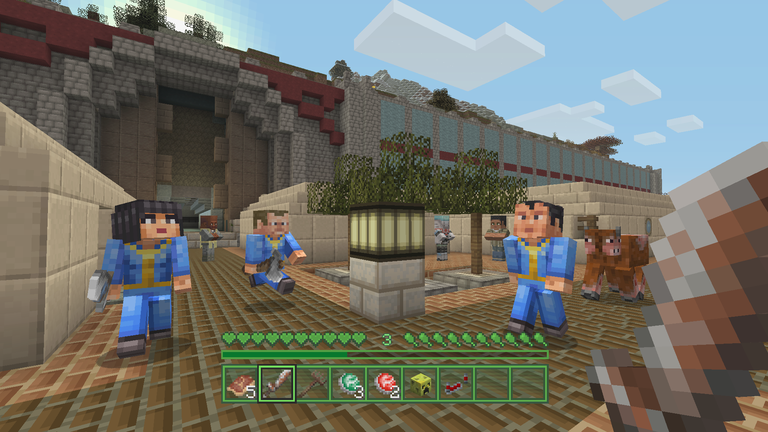 The trailer shows scenarios and structures reminiscing of Fallout’s ambiance and feel, although Minecraft lacks that yellowish, irradiated presence that FPS Fallout games are known to have. “Working in the depths of their bunker complex, our artists and builders have been busy blasting Minecraft’s glorious overworld into an irradiated wasteland fit for Fallout fans to wander. Friendly cows, gently sauteed in the light of a thousand suns, have now sprouted second heads, while the familiar supersized spiders have made way for other overgrown arachnids, who scuttle through the dark wielding brutal stingers,” wrote Marsh Davies on Minecraft’s blog. The Minecraft: Fallout Edition DLC will be available sometime this month for $5.99 on each system’s native game store. Minecraft: Pocket Edition is also celebrating its 5th year in the market. A game with over 40 million players will be able to reach its completion by letting players take on the Ender Dragon, the game’s final boss. Although one could play Minecraft infinitely, developers have inserted The End, where gamers can test their skills to reach a conclusion in their adventure. A game that at first was a crude block-building simulator has now become a worldwide community where players can create circuits, join different realms, play with people using other consoles, take part in pig races, and create enormous cities for the awe of anyone that dares to visit. Currently, Minecraft is owned by Microsoft, and the company is aiming toward making it this generation’s Super Mario Bros. The tech giant bought the game for $2.5 billion and has put a whole deal of incentive into making it a lasting game, available on any system imaginable. Minecraft has easily surpassed the 100 million sales in only five years, and it will probably keep on rising due to the game’s accessibility and friendly learning curve. Microsoft intends for Minecraft to become a 100-year brand, allowing future adults to go back and explore their creativity in a game that they loved as children. Similar to Lego, Minecraft has the unique component of free construction, where the experience for each person is completely different from each other. Furthermore, the game’s compatibility with mods makes it the perfect starting point for future game developers to test their skills by creating worlds where they can have fun however they desire and share it with others.